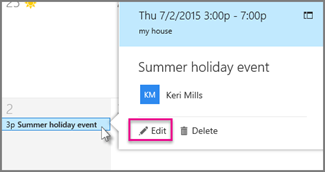 You can create, modify, or delete a meeting or appointment in Outlook on the web. When creating a meeting or appointment, you can browse for available rooms. Click on the calendar at the day and time when you'd like the event to occur. Select Add a location to see a list of suggested locations. Select More options to open the full window. 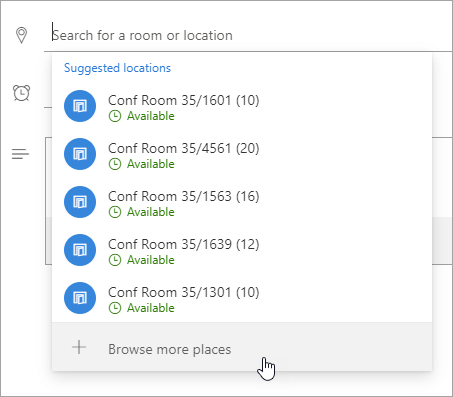 In the full window, select Search for a room or location > Browse more places. Choose a location, or use the search bar to search for a city or room list. Select the meeting or appointment in your calendar. Select Cancel if the event is a meeting, or Delete if the event is an appointment. If you're canceling a meeting, add a message if you want, and select Send. This event: Choose this option to cancel or delete the event you've selected in the calendar. 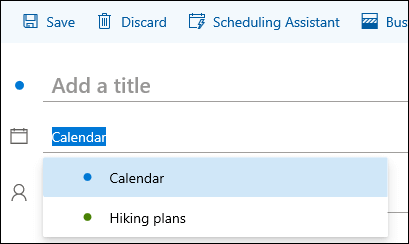 This and all following events: Choose this option to cancel or delete the event you've selected in the calendar and all subsequent events in the series. All events in the series: Choose this option to cancel or delete the complete series of events. If the event is a meeting, select Cancel. If the event is an appointment, select Delete.